As I mentioned in the previous post, this summer I am employed as a summer intern at Opera Software in the department of Quality Assurance on mobile devices. This post is about the first four of my eight weeks there. Opera. Chances are you have heard of them. What about Statoil? Telenor? DNB NOR? Hydro? Unless you are Norwegian I doubt you will have heard of most of them. Why would you? They’re only Norway’s four largest companies. Opera is not one of Norway’s four, or even fifty largest companies, yet, chances are you have probably heard of them. Of course, relatively speaking they have quite a small market-share, but I would still say Opera is a significant actor in the play that is the technology-industry on the stage that is the internet. Sure, Microsoft, Google and Mozilla may be the father, mother and son, but Opera would at least be the cool, slightly quirky, uncle who just returned from the jungle having found a long-lost treasure. You know, the character the audience wishes they were more like. I digress, but the point I am trying to make is that being a bit of a geek, working for Opera is cool. Very cool. Aside from everything else, just having a job in a company like Opera is something I hadn’t at all been expecting to happen, and being given the opportunity to see a company like Opera from the inside is amazing. Turns out, actually working there is amazing too. Aside from everything else, the educational value of the past weeks has been immense. Granted, this is my first job, so I probably have quite a bit to catch up on. I knew it was going to be a learning-experience, but the way in which it has been was far from what I expected. It’s hard to think of, let alone describe, exactly how it has been educational. It’s like having been dropped into something rather familiar, but completely new. One of the less obvious aspects of having a job is that one actually has to work. The first days I naturally spent getting to know the place. By day three I had found out how to actually exit the building, and could focus on getting my head around the work that was being done there. I fared well, had three weeks of fairly relaxing, consistent, bug-finding and general Quality Assurance’y stuff. Then week four came along. My desk on Thursday of week 4. 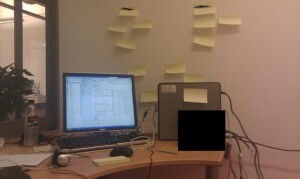 During Friday the post-its became even more plentiful, until I finally transferred them all into a note-book. A bit of a back-story is needed to understand week four. Apparently some people, especially those who work permanently at Opera, like going on vacation to places that isn’t Opera, and doing something that isn’t work. At the end of week three my mentor, the other QA-guy working on the project I was working on, went on holiday for a week. Also at the end of week three, the project manager went away for a three week vacation. As a consequence of this the head QA, who had returned from vacation a week previously, was temporarily made Project Manager. The net result of this was that I was the only guy working as a QA on the specific project for the week. On the top of this, Thursday of week four was a milestone for the project, i.e, it was bound to be hectic. I have signed an NDA, so I probably can’t really go into specifics about what I did, but I was doing stuff related to a thing running on a gadget thingy-thing and another thing. It’s not that I didn’t have things to do the previous weeks, but a lot of time was spent “randomly” looking for bugs. Week four wasn’t like that. Week four was busy. Very busy. I spent a lot of time trying to do stuff I had never done before in a way that wasn’t too wrong. I didn’t really have the time to worry about if I was doing it correctly or not, I just had to do it. I even think I did ok. It was a very busy week, but it was also the most fun week I have had in a long time. Overall, being half way through my summer internship, the conclusion is that I have really, really enjoyed myself. The working environment is wonderful and inviting, and the people are great. I’ve basically just come in and crashed their party, but I feel like I have been welcomed and even kind of integrated into the team. I feel like I am actually adding some value, and while I am still trying to get over the confusion of someone being crazy enough to pay me for doing something, I at least feel that I am doing some work for my salary. I would go on with singing Operas praises, but I spent all my energy thinking of that pun. I won’t go into detail on the great canteen, assorted free hot and cold drinks and the other general wonders and perks of the office. It is all very well and nice, but not really important. The important thing, at least to me, is that after four weeks I still look forward to going to work every day, and I think that is pretty much the highest praise that can be given to any job. I am very thankful to Opera for making my first job-experience this good. Quite a significantly placed yardstick has really set by which I will rate my future jobs.